Liverpool's Champions League hopes received a second boost when Sevilla, who began the night leading Group E, were stunned 5-1 by Spartak Moscow. 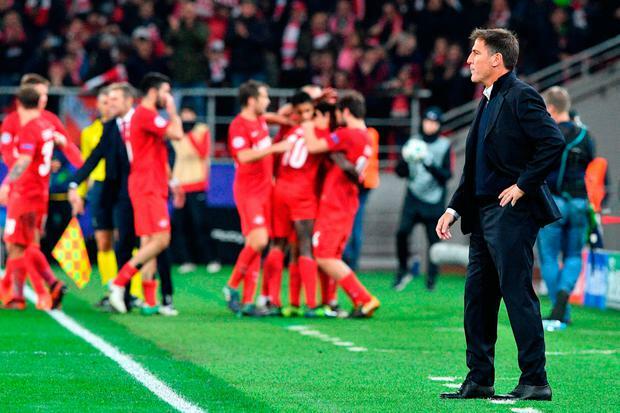 Spartak scored four times in the second half through Lorenzo Melgarejo, Denis Glushakov, Luiz Adriano and Quincy Promes to join Liverpool on five points at the halfway stage, with Sevilla one behind on four. Tottenham are also well placed make it to the knockout phases as Borussia Dortmund could only draw 1-1 at Apoel Nicosia, with those two teams still six points adrift of Spurs and Real. Two errors from Dortmund goalkeeper Roman Burki led to Mickael Pote opening the scoring for the hosts, with Sokratis Papastathopoulos' equaliser at least ensuring the visitors returned to Germany with one point. In the other game in Manchester City's group, Bernard scored twice as a Shakhtar Donetsk side that finished with 10 men overcame Feyenoord 2-1. Monaco's dreadful campaign continued as last year's semi-finalists were beaten at home by Besiktas. Monaco are now bottom of Group G with just a solitary point from three games as RB Leipzig defeated Porto 3-2, with all five goals coming in the first half.